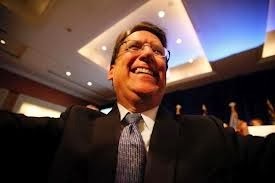 Looks like Governor Pat McCrory, a former Duke Energy executive and current Duke Energy cuddler, is trying to look as though he's getting right with Jesus. Yesterday, he publicly called on his former employer and current major political contributor to move its coal ash ponds away from water sources. Those were words, of course, not action. Action would have involved McCrory's top guy at the Department of Environment and Natural Resources, John Skvarla, actually taking tough steps against Duke Energy to keep our water clean. So far that action has been sorely lacking. But now the Feds have opened a criminal investigation, and McCrory needs to look like something other than a creature owned lock, stock, and leaking ash pond by Duke Energy. It's just sad that it took the tightening reach of federal subpoenas for McCrory to begin to sound like a governor thinking of the public interest, let alone acting in the public interest.